After a giant breakout year in 2017, this performer continues to deliver with her debut project, which features “Bodak Yellow” and “Bartier Cardi”, a collaboration with 21 Savage. With massive streaming potential, and a solid sales total, this set will likely top the album chart on next week’s update (and might reign for more than one week.) Look for potential boosts to come from a highly-anticipated performance on Saturday Night Live and a co-hosting slot on The Tonight Show Starring Jimmy Fallon on Monday night. Ahead of Elton John: I’m Still Standing – A Grammy Salute, which airs Tuesday night on CBS, these two compilations hit the market. The former set features largely country acts, while the latter set features a mix of pop, rap and rock artists. Next week: look out for new albums from Bazzi, Jason Aldean and more. For Adam’s personal picks of the week, listen to the PGTC Friday Faves list on Spotify! In the last day, it was announced that Adam Lambert‘s first single from his Warner Bros. debut, The Original High, is a song titled “Ghost Town”. It will be released on April 21. 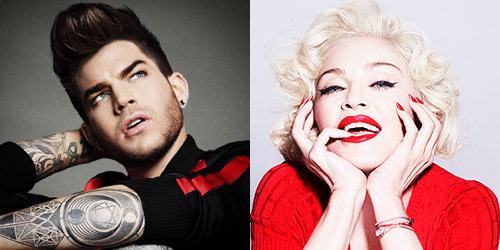 This comes at the same time that Madonna‘s current release, title stylized as “Ghosttown”, is charting at both AC and Hot AC radio outlets thanks to an iHeartMedia campaign that bares a similar feel to the one U2‘s “Every Breaking Wave” utilized from late last year to early this year. Needless to stay, the stan reaction has been mixed thus far, but I think we’ll all survive and both singles can co-exist together… right? Now, can they rank together? The first documented case of this occurrence goes back nearly 36 years to when these two bands appeared with their hit songs in the top 40 for just one frame. At the time, it was a pretty remarkable chart achievement given the turnover rate and heavier competition during those disco days. Both acts would score their final hits in the next decade, the former after nearly a decade away from the top 40. Here’s what may be the most unusual case of the ones presented here. Both “Cruel” cuts debuted in the top 40 during the same week and next to each other! For two weeks in October, they both resided in the top ten, including a week when the former fell to #9, while the latter jumped to #8 (October 22, 1988). Of course, the band covered an Elvis Presley tune, while Brown’s hit was an original song. Much like the previous 1988 example, these two female groups both crossed paths in the top ten later that summer and spent a week back-to-back for the chart date of June 30, 1990 (the former down to #5, while the latter climbed to #6.) Both California acts were on the Hot 100 with their debut singles and the trio and quartet, respectively, would have a number of other songs in the top five nationally. It was during the first weeks of 2003 that the pop chanteuse shined with her strong multi-format ballad, a song that would turn into one of the biggest singles of her career. However, when the big Dogg comes barking into town, people will be tuning in. So, both appeared in the top 40 together through mid-May. On CHR radio, Aguilera’s hit spent four weeks at #1, while the trio just broke into the top 30. For more chart trivia and much more music madness, follow the blog by clicking below and/or click the “Get Social!” page link at the top to find PGTC on social media sites like Facebook, Twitter and more.